Department of Art | Artists/Party Host Wanted! Home » Artists/Party Host Wanted! Make fantastic money while having a ball! 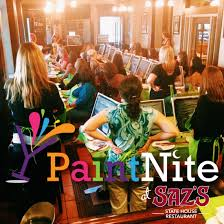 Paint Nite is the nation’s leading “sip and paint” experience. I am looking to hire people who love to have fun, entertain a crowd, and help our customers create fantastic works of art. This is not a painting class with wine… this is a DRINKING PARTY WITH ART! This is the perfect part-time gig to supplement your current job – as most events are in the evenings. You can expect to make around $100 -150 plus tips or more per event (2 hour session, plus set up and of course clean up). No more “starving artist”! Occasional special events on weekends will really boost your earnings as well, and those pay even more! And you don’t have to pound the streets and sell tickets to the event. This is not a multi-level business or scam to make you pay money for stuff. I’m simply looking to hire some great people who love to have fun and paint! * Available to work at least 1 – 2 Paint Nite events per week – and if you can do more – fantastic! You will earn more money and have more fun. * Reliable transportation is a MUST. You should have a car big enough to transport yourself, and 5 “cooler sized bins” of art supplies (Canvas’s paint pumps, brushes, aprons, etc.) A hatchback, Subaru, etc. would be ideal, but hey, I’ve seen people do it with the VW BUG. You can’t let our awesome customers and restaurant/bar hosts down by not showing up. If you are the type of person that can’t keep a commitment – don’t waste my time by applying for this amazing gig. *You don’t have to use original paintings – you will be supplied with paintings – but you can make some extra dough with your own art creations – I look forward to telling you more about that! One artist recently made several thousand dollars in commissions – so if you have some cool original works you are willing to put in the Paint Nite library, you never know how much you could make! * You must be fun! Did I mention this is a drinking party with art included? If you are so serious about your art that you are uptight and prefer to work alone in your basement all the time, this ain’t the gig for you. This is going to be a fun ride. I don’t ride with people who are full of drama, don’t smile, are uptight, lack maturity, or can’t keep a promise. * You must be willing and able to post photos of our events on social media. * Must be willing to take assigned events in Tallahassee and nearby communities. *Occasional duties include supply hauling/receiving to assist the team and keep you working. *You will receive training videos and shadow a local Master Artist for a couple of events to learn how to conduct the events once you are hired. 2) Photo of you – from this year – not your high school photo! 4) Short summary of why you think you would fit and why I should hire you! Get in your resumes as soon as possible. We will be interviewing the second to last week of January and beginning of February 2016.